With physicians busier than ever before and the roles of many leading health professions incurring higher workloads, the need for important support in data recording and collection has become a necessary part of health care. Here, a medical transcriptionist fills in the gaps that occur as medical doctors are pushed through their busy days. Medical records are not only abundant but vital to protecting the public and providing excellent quality healthcare. Each time you visit a doctor, for example, a new medical record is generated. On top of that, the industry itself is rapidly moving into the age of electronic health records, which allows for the storage of patient health histories that can be accessed by various relevant physicians and providers of healthcare. Medical transcription translates oral records to written form, whether that is the more traditional paper form or an electronic one. This record can include a patient's medical history, their diagnosis, treatment and the outcome of their health care. Although nothing can take away from the years of education, experience and expertise that a physician brings to the workplace, a medical transcriptionist does provide somewhat of a backbone to a physician's work. In this sense, they support a physician's work and make it more organised and seamless. With a medical transcriptionist, a physician can dictate and transmit the extremely private and complicated medical information about a patient, which a transcriptionist then communicates into paper or computer records from the physician's spoken word. Their work allows physicians to focus more on the patient's health rather than on the time-consuming aspect of writing out records. Instead, a physician uses his or her voice and records the records, which a qualified medical transcriptionist then translates into a dependable medium. Even better today are the speech recognition systems that act as a 'middle-man' to translate the physician's dictation into a very rough draft of the information. A medical transcriptionist will then clarify and polish the draft into a completed, accurate and organised document. There is a mistaken belief that successful dictation in medical transcription involves rapid keyboard typing and related skills. While a consistent, solid speed is important, the most important aspects of medical transcription are that the transcriptionist has excellent medical knowledge, good judgement and logic as well as the capability to find any medical issues or inconsistencies in the dictation. If something is awry in the dictation, a medical transcriptionist must seek out the correct information to ensure that the report is accurate. The studies for medical transcription are not particularly lengthy or expensive, which make this an attractive option for someone who prefers less preparative training for their career. A deep knowledge and understanding of medicine is important, particularly the complicated medical terms used in health care. A medical transcriptionist must also have a good working knowledge of the medical language used for areas such as anatomy and pharmacology. As such, a medical transcriptionist is actually somewhat of a specialist in the English language. Studies usually include the biological sciences, medical language, terminology of various surgical procedures and instruments, pharmaceuticals, laboratory testing and a broad knowledge of research techniques used in medicine. Courses are taught at colleges and universities, most of varying lengths but ranging from certificate to degree level. A good medical transcriptionist must also have an excellent set of writing skills, including good grammar and punctuation. They need to be consistent in following the physician or health professional's voice during dictation, which ensures information is accurately recorded. 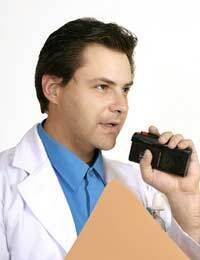 One of the major benefits of medical transcription is that it often allows a person to work from home. With priorities such as children, this can be a welcome relief for parents who want to work and raise their children at the same time. Their work does not involve direct patient contact and they may also work in more remote rooms in hospitals and clinics. The salaries range a great deal, particularly because this type of work offers much flexibility in the hours worked each week. Overall, however, the field is continuously growing and medical transcriptionists remain in-demand in the health care field. A career in medical transcription may be for you if you want the diversity of providing important supportive services for physicians and other health professionals. If you also have a good attention to detail and a strong mastery of the English language combined with a passion for health, then you should continue to think about a career in medical transcription. You can ensure that patient records are accurate and kept confidential while you also provide important support to the work of other medical and health professionals. @CC - As suggested by the National Careers, another option is to gain useful experience through an NHS administrative and clerical work placement. You can access the link herealong with other associations which offer training. If you can't afford the funds, have you thought of an apprenticeship? See link here. I hope these help.